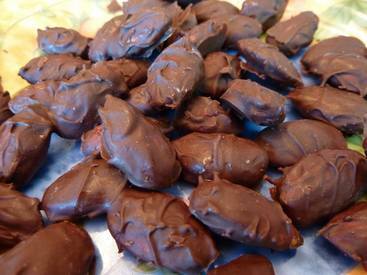 Today is National Milk Chocolate with Almonds Day, so this recipe was a no-brainer! Line a plate with wax paper. Temper or Melt Chocolate. This is where most people use a double boiler, but I’ve never had a problem melting Chocolate right in a pan on low heat. Stir until melted. Add almonds. Stir until the almonds are evenly covered. Lift out each almond. Set onto the wax paper. Place in the refrigerator for 3 hours. Separate from the wax paper with a rubber spatula. Because I used Milk Chocolate, the finished product melted very easily when they were left out on a plate on the counter (tempered chocolate will not melt as easily). I would probably store them in a sealed container in the refrigerator until eaten. I’d like to try this recipe with Dark Chocolate to see if they set up better and don’t require the constant refrigeration. White Chocolate would be interesting do to as well.